The AP story here: "Renaldi 'Ray' Ruggiero, whom prosecutors identified as a capo or captain of the family's operations in South Florida, appeared in federal court in Fort Lauderdale Friday morning, along with his co-defendants: Genovese family "soldier" Albert "Chinky" Facchiano, and family associates Joseph Dennis Colasacco, Mitchell Weissman, Francis J. O'Donnell, Clement Santoro and Charles Steinberg." *Apparently, the PD's office also represents a potential witness in the case. UPDATE -- Here's more from the Herald about this witness, nicknamed the Sultan. ANOTHER UPDATE -- The Daily Business Review has more on the conflict issue here. Despite the early word on the Roberts' Court -- that everyone was getting along, that there was going to be consensus, and that it was going to be a much different court -- we got back to the old bickering this week. The Court decided three decisions yesterday -- two were 5-4 (the Kansas death penalty case and the right to counsel of one's choice case). In both cases, there were very animated opinions sniping back and forth. And then there was the campaign finance decision, a 6-3 affair but with 6 different opinions for the "winners." Not kidding. Barely one day old, and Gonzalez-Lopez is already making waves in corporate law. To see the connection, however, you’ll have to bear with me for a bit of brush-clearing. Judge Lewis A. Kaplan (S.D.N.Y.) today ruled on certain individual defendants’ motions to dismiss an indictment arising from the KPMG tax shelter investigation. (Large pdf here.) According to the defendants, their due process rights were violated when the U.S. Attorney pressured their former employer (KPMG) not to advance and reimburse legal fees incurred as individuals defendants. Judge Kaplan found a due process violation, scolded the government, and suggested a new lawsuit against KPMG to recover those legal fees, in which today’s decision would have collateral effect and make the proceedings summary. In short: the decision seems to constitutionalize the right to receive indemnification from your employer. KPMG had a "longstanding voluntary practice" of paying legal fees where employees required separate counsel in matters arising from the employment relationship, regardless of whether the employee had been charged criminally or civilly with wrongdoing. These arrangements were not memorialized in the partnership agreement governing most of the defendants, nor were there contractual provisions about it. No mention is made in the opinion of the relevant insurance negotiations or provisions. The background law governing most of the partner-defendants (Delaware) requires neither indemnification nor pre-payment. However, two of the defendants, mere employees residing in California, had a right to indemnification arising out of California statutory law. Judge Kaplan construed this arrangement as a legal entitlement. At the least, according to Judge Kaplan, the defendants had "every reason to expect that KPMG would pay their legal expenses in connection with the government's investigation." (But this was the sort of expectation, as Judge Kaplan later argued (p.57) that might give rise to a tortuous interference claim). In the alternative, and in a footnote, Judge Kaplan wrote that "arguably" the defendants had a contract "implied in fact from KPMG's uniform past practice and the circumstances of the business." (Fn. 119). KPMG got the message. Shortly thereafter, KPMG notified the defendants that their legal fees would be compensated only as long as they cooperated -- they could not take the Fifth, for example. Further, KPMG apparently capitulated to the government's demand by backing away on a recommendation that the defendants obtain counsel. Judge Kaplan found that this conduct by the government violated the defendants’ right to a fair trial and (I think) to counsel of their choice. In a passage of the opinion I don't really grasp, the court (p. 49) found that the pressure to cooperate exerted by the Thompson memorandum (the relevant prosecutorial guidelines) on KPMG should be subject to "strict scrutiny" because (1) this will be a big trial, requiring "substantial resources"; and (2) the government interfered with the ability of the KPMG defendants “to obtain resources they otherwise would have had." While the government claimed that it only used its guidelines to infer lack of cooperation when the payment of fees was used to impede investigations, the court found that the public perception of such pressure is what matters: "[f]ew if any competent defense attorneys would advise a corporate client at risk of indictment that it should feel free to advance legal fees to individuals in the face of the language of [the guidelines." (p.51) And, under Gonzalez-Lopez, this prejudice creates a per se violation. Judge Kaplan appears to hold that the prosecution guidelines are unconstitutional to the extent that they pressure corporations not to provide indemnification to their employees. To sum up. KPMG, which had no clear contractual obligation to pay these fees, now must do so compelled by a judicial order. The government can not discourage indemnification to criminal defendants as a part of making a decision about the firm's cooprative attitude (or, at least, it can't do so in writing). One possible result of the case: potentially vulnerable firms will draft by-laws or contracts that exclude indemnification absent cooperation, to make clear that the government has the right to demand cooperation from employees. The prosecutors, scolded by the court as “economical with the truth” (p. 80-81), must be feeling angry. The defendants, 83 pages later, are still going to trial. But the 28 private firms listed in the caption will get paid. Assistant Federal Defender John Wylie is now representing Narseal Batiste, the supposed leader of the terrorist suspects. I've known John Wylie for a long time -- he's a *great* lawyer. At the hearing, the U.S. Attorney's office objected to the Federal Defender's appointment saying that the office was already representing a witness. Magistrate Judge Patrick White took the parties sidebar and explained that for now the PD's office would be appointed and if a conflict was later proven, both sides could deal with it. The other lawyers on the case are all appointed from the criminal justice act panel. 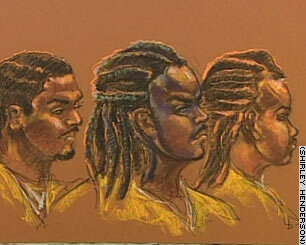 The Sears tower terror case has been indicted in the Southern District of Florida in front of Judge Joan Lenard. Here is the indictment. And here is Judge Lenard's background. Also, does is strike you as strange that every article is mentioning that Jose Padilla is awaiting trial in Miami? There is no alleged connection with these arrests and Padilla so why does every single article mention him? Wow. Unbelievable. We've been waiting for this for so long. So happy for them... especially Zo. When he blocks a shot, it's better than 5 baskets. Wade is beyond words. Shaq delivers on his promise. UD comes up big. Payton's huge shots. Walker's 3rd quarter. Clutch Posey... And how about Riley. So many great story lines. Everyone in Miami is dragging a little today from the last 2 months of playoff hoops. But it is such a happy tired feeling... What a great year. If the Heat isn't your thing, and you need Southern District news, check out this Padilla report in the Herald (concerning Judge Cooke granting some pre-trial motions for the defense) and a lengthy article about his co-defendant Adham Hassoun in the Daily Business Review. So reports the AP here. They are in full cooperation mode. I have to imagine that there are a number of nervous congressmen. Congrats to two colleagues -- Reemberto Diaz and Barbara Lagoa. Jeb Bush appointed Reemberto to serve as a state trial judge and Barbara to serve as a state appellate judge. I have tried cases with Reemberto Diaz and have had cases with Barbara Lagoa and believe they will make fantastic judges. Below is the Miami Herald squib with the background on both. I wish both of them well. The criminal defense bar will miss Reemberto and the U.S. Attorney's office will miss Barbara Lagoa. Congratulations again to both. Gov. Jeb Bush appointed Assistant U.S. Attorney Barbara Lagoa to the Third District Court of Appeal and Miami attorney Reemberto Diaz to the Circuit Court on Friday. Lagoa, 38, of Coral Gables, will be the first Cuban-American woman to serve on the 11-member appellate court for Miami-Dade and Monroe counties. She fills a vacancy created by the resignation of Judge David Levy. Prior to joining the U.S. Attorney's Office in 2003, Lagoa was in private practice at the law firm of Greenberg Traurig. She is a graduate of Florida International University with a law degree from Columbia University. Diaz, 49, of Coral Gables, is filling a vacancy created by the death of Circuit Judge Henry Leyte-Vidal. Diaz is in private practice. He is a graduate of the University of Miami, with a law degree from Nova Southeastern University. Julie Kay reports today that there was bomb scare at the federal courthouse. The article is below. Anyone know what case this is? When police blew up a suspicious box that caused the evacuation of two federal buildings in downtown Miami, they may have blown up a federal criminal case. Authorities evacuated the courthouses Monday due to a bomb scare. 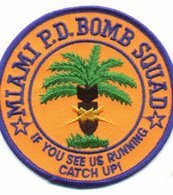 The Miami Police bomb squad responded and destroyed the box, but it may have contained evidence from a just-decided case. The James Lawrence King Federal Justice Building and the David W. Dyer Federal Building both were evacuated at about 2:30 p.m. for an hour or so on Monday. Hundreds of attorneys and courthouse staffers were ushered out of the buildings by federal marshals wearing yellow vests. They were directed to the street in front of the Federal Detention Center while the bomb squad did its work. Federal judges and magistrates were taken out of the building separately and taken to an undisclosed location. “A special robot went over to the box, and it went kaboom,” said Mark Schnapp, a partner at Greenberg Traurig in Miami who was at the U.S. attorney’s office when the building was evacuated. But according to two lawyers who were present during the bomb scare and did not want to be named, it turned out that the box contained papers and evidence left on the sidewalk by a federal agent. "Is it legal to fire a woman because her breasts are too large?" Via Ann Althouse, that is the legal question presented in the case of Alice Alyse v. the producers (and various other people associated with) Movin' Out (the Billy Joel musical), filed here in Miami. Alice is represented by Larry Klayman. Here's the Washington Post article. Here's the lawsuit. And here is her website (in case you want to judge for yourself). I went to the Bill Clinton/Bill Nelson event tonight. Speakers included: Clinton, Nelson, Nelson's wife Grace, his son Billy, Jim Davis, Rod Smith, Alcee Hastings, and Debbie Wasserman-Schultz. Other than Clinton who everyone was there for, I thought Alcee stole the show and the night. All of the speakers joked that Clinton was late, as usual. But he, as always, delivered a magnetic speech -- there is a rock-star quality to the former President. Fed up with the inability of two lawyers to agree on a trivial issue in an insurance lawsuit, a federal judge in Florida this week ordered them to "convene at a neutral site" and "engage in one (1) game of 'rock, paper, scissors' " to settle the matter. Childish lawyers are commonplace, but the use of children's games to resolve litigation disputes is apparently a new development. The judge, Gregory A. Presnell of Federal District Court in Orlando, wrote that his innovation was "a new form of alternative dispute resolution." The proximate cause of Judge Presnell's ruling, issued Tuesday, was a motion saying the two lawyers in the case could not agree about where to conduct the deposition of a witness. The choices were the building where they both work, four floors apart, or a court reporter's office down the street. Judge Presnell's order indicated that deciding such things was not part of the job of a federal judge. Still, wary that the lawyers would start a new battle over where to conduct the rock-paper-scissors showdown, Judge Presnell gave them a default site: the front steps of the federal courthouse in Tampa. That will not be necessary, said David J. Pettinato, a lawyer for the plaintiff. He and his adversary have agreed to meet on June 30, Mr. Pettinato said, at "an undisclosed location." Mr. Pettinato added that he had been wasting no time since the order came down and had been training with his daughters, who are 5 and 9. They have advised him to open with rock. Mr. Pettinato said he was inclined to agree "because my case is solid as a rock." That would be an unusual opening for a lawyer, said Matti Leshem, the co-commissioner of the USA Rock Paper Scissors League, which he described as the governing body of the sport, whose headquarters are in Los Angeles. "I guarantee you right now," Mr. Leshem said, "that both lawyers will open with paper. Lawyers open with paper 67 percent of the time, because they deal with so much paper." Mr. Leshem offered to officiate the match. "What I don't want," he said, "is some rogue element of rock-paper-scissors coming down from the bench. When the law takes rock-paper-scissors into its own hands, mayhem can occur." The second lawyer in the case, D. Lee Craig, declined through a spokesman to preview his strategy. Judging from the spokesman's tone, Mr. Craig did not find the matter especially amusing. That would be in keeping with the compliment Mr. Craig paid to Mr. Pettinato in a letter last week. "Apparently you think it is in your client's interest to create as much misery and bad feeling as you are able," Mr. Craig wrote. "In those endeavors, you are most able." I had previously posted about Judge Altonga's JNOV in the $78 million verdict against Arriva Pharmeceuticals. Here's Julie Kay's take on the knock the wind out of (or into, depending on what side you're on) your sails ruling. There is a lot of gossipy stuff in here, including how the lawyer who initially lost the case, Jonathan Goodman of Akerman Senterfitt, was dubbed the $78 million man at his firm; the fact that he found out about the verdict while on vacation skiing; and that he sent around an email that was forwarded to everyone in town after Altonaga's ruling vindicating him. Round 1 to Jim McDonald. Round 2 to Jon Goodman. Round 3... Any bets? Gordian knots that the parties have been unable to untangle without enlisting the assistance of the federal courts – it is ORDERED that said Motion is DENIED. Instead, the Court will fashion a new form of alternative dispute resolution, to wit: at 4:00 P.M. on Friday, June 30, 2006, counsel shall convene at a neutral site agreeable to both parties. If counsel cannot agree on a neutral site, they shall meet on the front steps of the Sam M. Gibbons U.S. Courthouse, 801 North Florida Ave., Tampa, Florida 33602. Each lawyer shall be entitled to be accompanied by one paralegal who shall act as an attendant and witness. At that time and location, counsel shall engage in one (1) game of “rock, paper, scissors.” The winner of this engagement shall be entitled to select the location for the 30(b)(6) deposition to be held somewhere in Hillsborough County during the period July 11-12, 2006. If either party disputes the outcome of this engagement, an appeal may be filed and a hearing will be held at 8:30 A.M. on Friday, July 7, 2006 before the undersigned in Courtroom 3, George C. Young United States Courthouse and Federal Building, 80 North Hughey Avenue, Orlando, Florida 32801. LOVE IT! Okay, so there's going to be a high stakes games of rock-paper-scissors... What is your strategy? Do you start with the safe play of rock or do you get coy and go paper? But then again, maybe you should start with scissors... Ah, the complexity and strategy of a good r-p-s game! It really should have been best of 5 or at least 3 so that the lawyers could get a feel for each other, don't you think? Jack Bauer or real life? Jose Padilla's lawyers want a federal judge to throw out key evidence because the alleged al-Qaida operative's arrest was based on statements from one source who claims he was tortured and another who was heavily medicated and possibly unreliable. The evidence should not be allowed at Padilla's trial set for this fall based on an FBI affidavit "that distorted the facts in an apparent disregard for the truth," Padilla attorneys [Andrew Patel, Michael Caruso, Tony Natale, and Orlando do Campo] said in a court filing. Kinda scary, no? And I don't think I'm against torture in all cases. I take the view of one of my law school professors, Alan Dershowitz, that we should debate the issue about when torture can be used and who should be accountable when it is. Certainly, a judge should have to approve it where practicable; the standard for employing it would have to be very high; whatever evidence is obtained by use of the torture should not be admissible in court; and it should only be used in life or death situations where absent torture people would die. Even in these *very* limited circumstances, I'm still extremely queasy about it, but it strikes me that there may be a case of mass terrorism where a large number of people would die absent torturing one of the involved terrorists. Suppose a suspect knew the location of a bomb that was to go off in a matter of hours that would kill thousands of people. If that person absolutely refused to disclose where that bomb was, would anyone chose letting the bomb go off over trying to extract the information from the captured terrorist? But Padilla's case is the other end of the spectrum. With Padilla, the feds were trying to build a case against someone who was already in custody. I can't imagine torture in those circumstances could be justified, and certainly such evidence -- if truly acquired by use of torture -- should not be admissible in a court of law. A federal judge has declared a state law requiring students to stand for the Pledge of Allegiance unconstitutional, stating it violated the rights of a Palm Beach County student who sued the state last year. U.S. District Judge Kenneth L. Ryskamp also ruled unconstitutional the provision of the 1942 Florida law requiring students to obtain permission from their parents to be excused from reciting the pledge. The American Civil Liberties Union cheered Ryskamp's decision as a landmark ruling that upholds all Florida students' free speech rights. "The highest tradition of being an American is freedom of thought and freedom of speech," ACLU attorney James Green said Thursday. "Freedom of speech includes the right to speak and the right not to speak, and not to be forced to speak in a certain way." But conservative legislators decried the decision, which they said was an assault by "liberal" and "activist" judges on the beliefs of the majority. State Sen. Mike Fasano, R-New Port Richey, called the decision "ludicrous." Fasano this year spearheaded an unsuccessful attempt to ask Florida voters to decide whether the state constitution should require students to stand and recite the pledge. Students would have needed a parent's permission to be excused. "What a federal judge has done is taken away patriotism from our schools," Fasano said. Ryskamp was appointed by President Reagan. 1. Holland & Knight raised 1st year associate salaries to $120,000: "In a change of plan, Holland & Knight is bumping salaries for first-year associates in Miami, Fort Lauderdale and West Palm Beach from $105,000 to $120,000. That will include a $5,000 signing bonus. Holland’s move raises the ante for other major South Florida corporate law firms, which are paying $115,000 at most for entry-level associates. Only White & Case in Miami is known to be paying first-years $120,000. Holland’s announcement Tuesday was unexpected, because major salary increases typically are announced around the start of a law firm’s fiscal year. Holland’s fiscal year begins on Jan. 1." 2. "In a dramatic reversal, U.S. District Judge Cecilia Altonaga in Miami overturned a $78 million jury verdict against Arriva Pharmaceuticals and dismissed the case. In a post-trial judgment issued Friday, Judge Altonaga ruled in favor of the Alameda, Calif.-based pharmaceutical company. A Miami jury had awarded Clearwater-based AlphaMedPharma- ceuticals $48 million in compensatory damages in December, and $30 million in punitive damages in January. It was one of the largest patent infringement cases in U.S. history. . . . Arriva, represented by Akerman Senterfitt shareholder Jonathan Goodman, filed a post-trial motion arguing that the verdict should be vacated because the likelihood that AlphaMed actually held a patent to a drug that would be successful was very slim, making the damages awarded unreasonable. " 3. Also here's a story by the Herald's Oscar Corral about the appeal of the detention hearing of alleged Cuban agent Elsa Alvarez before Judge Moore: "The detention of accused Cuban agent Elsa Alvarez was discussed in federal court Wednesday, about five months after she was jailed for allegedly sending information to the Cuban government. Alvarez, a counselor at Florida International University, and her husband, FIU psychology Professor Carlos Alvarez, were arrested in January. The couple is accused of being unregistered agents for Cuba. Jane Moscowitz, a lawyer for Elsa Alvarez, said that a federal judge would decide in the next couple of weeks if Alvarez will be released on bond. Moscowitz said that the court gave a strong indication that it was leaning toward granting Alvarez a bond, subject to certain conditions as she awaits trial. The court did not indicate the amount of the bond, Moscowitz said. ''Elsa and her family are looking forward to being reunited,'' Moscowitz said."